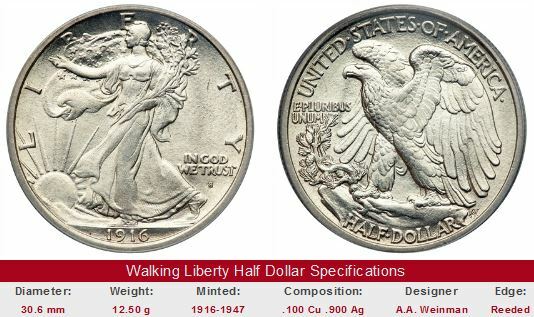 Walking Liberty Half Dollar Key Dates: A Look at the Best Coins in the Series. The Walking Liberty Half Dollar first appeared in late 1916. It was the third new U.S. coin released that year, joining the Mercury Dime and Standing Liberty Quarter. All new designs came about beginning in 1915, when Mint Director Robert Woolley invited three New York sculptors, Hermon A. MacNeil, Albin Polasek and Adolph A. Weinman, to propose new looks for the dime, quarter, and half dollar. MacNeil's quarter was selected. Weinman's dime and half dollar were also chosen. US Coin Values Advisor has completed Coin Value Tables for the Walking Liberty Half Dollar, reporting price trends over a long period of time for individual coins of the series. Some historians believe Woolley's original intent was to award each sculptor with one design, but this is not what happened. Instead, Polasek was left empty handed. Nevertheless, the new coinage of 1916 won praise for its artistic qualities and strong national symbolism, as the U.S. drew ever closer toward direct involvement in World War I.
Weinman selected a patriotic theme, depicting a full-length portrayal of a flag-draped Miss Liberty marching toward a glorious sunrise. The reverse design represented America’s military might, featuring a powerful eagle ready for flight, armed with fearsome talons. A few short months after the Walking Liberty coin was released, the world recognized these symbols as more than just an idle boast: The United States entered the conflict, mobilized quickly, and turned the tide of war against Germany and the other Central Powers. The design of the half dollar bears a full-length figure of Liberty, the folds of the Stars and Stripes flying to the breeze as a background, progressing in full stride toward the dawn of a new day, carrying branches of laurel and oak, symbolical of civil and military glory. The hand of the figure is outstretched in bestowal of the spirit of Liberty. The reverse of the half dollar shows an eagle perched high upon a mountain crag, his wings unfolded, fearless in spirit and conscious of his power. Springing from a rift in the rock is a sapling of mountain pine, symbolical of America. 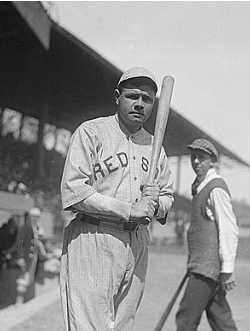 The great Babe Ruth of New York Yankee fame actually began his career as a pitcher for the Boston Red Sox, helping the Sox to World Series titles in 1916 and 1918. In 1920, Red Sox owner Harry Frazee sold Ruth to the Yankees for $100,000 and a $350,000 loan to finance Frazee's Broadway business. This turned out to be perhaps the worst decision in the history of baseball. In his next 15 seasons in New York, Ruth led the Yankees to four world championships. As for the Red Sox, their team struggled for decades while the Yankees continued to prosper. This great imbalance between the two teams led to a superstition dubbed the "Curse of the Bambino", alleged to have begun because the Sox sold Ruth, often called The Bambino, to the Yankees. The spell was finally ended after 86 years, when the Red Sox won the World Series in 2004. Walking Liberty Half Dollars, called "Walkers" for short, are actively sought by a core of serious collectors. The coin's attractive design and affordable availability for all dates and of Uncirculated examples dated 1934 and beyond have done much to build a devoted following. Mint State half dollars of 1916-1933 are generally quite elusive and require buckets of cash to obtain bona fide examples. Most Walkers are weakly struck, most notably during the World War II years, when coining dies were used far beyond their expected lifespan. Thus, sharply struck specimens command substantial premiums. The series ended in 1947. The Walking Liberty half dollar earned a great compliment in 1986, when the design was resurrected for the front side of the American Eagle one-ounce silver bullion coin. It has been minted every year since. Some people would have included the 1916-S in place of the 1916, but thanks to a terrific surge the last few years, the 1916 now outranks the 1916-S, at least in percent returns. Really, though, you can't go wrong with the 1916-S, either. A good place to begin your search is online coin auctions at eBay. If your joy is to collect later date Walker gems, be careful! Because of the popularity of Walking Liberty Half Dollars, too many crooked promoters (e.g. telemarketers from the 1980s) cleaned coins and misrepresented them as higher grade material to unwitting buyers. Thus, the supply today is somewhat tainted. You can reduce the possibility of getting stuck by insisting that key date or gem Walkers have been certified by one of the "Big Four" grading services, PCGS, NGC, ANACS, or ICG. If not certified, then at least make sure you're buying from a highly reputable dealer. The left hand side of each "Sales Box" is value trend data over a very long period of time for the date headlined, in VG-8 condition. The percent annual increase is computed for comparative purposes. The coin pictured for sale in the right hand side is not necessarily an example in VG-8 condition.